Wed., March 8, 2017, 1:44 p.m. The billionaire businessman spoke Wednesday at Jacksonville’s state of the franchise address, expressing frustration about the team’s lack of success in his five seasons. The Jaguars are a league-worst 17-63 during his tenure. They have scored the fewest points (1,445) in the NFL in those five years and allowed the most (2,153), a staggering stretch of futility on both sides of the ball. Khan fired coach Mike Mularkey and general manager Gene Smith after his first season and parted ways with coach Gus Bradley in November after the latest lackluster campaign . He hired former Jaguars and New York Giants coach Tom Coughlin to oversee football operations and Doug Marrone as head coach. He retained general manager Dave Caldwell, although with diminished power. Khan has poured money into the franchise, including $75 million to help the city upgrade amenities in and around the stadium. He’s spent more in free agency than anyone in the league the last three years, handing out $488.4 million in contracts that included $183.6 million guaranteed. Do the math: That’s $16.7 million per win (11) in that span, hardly the kind of return on investment Khan anticipated. “My expectations most of my life, it’s like, I’m going to roll up my sleeves and I’m going to do it myself. OK, unfortunately you can’t do that with football,” Khan said. “I think we put everything in place and I’m really, really excited with Tom and Doug and Dave to really have more football IQ in the building, so to speak, and we want to add more brainpower from that viewpoint, which can figure out, evaluate the players, the schemes, to help us win. 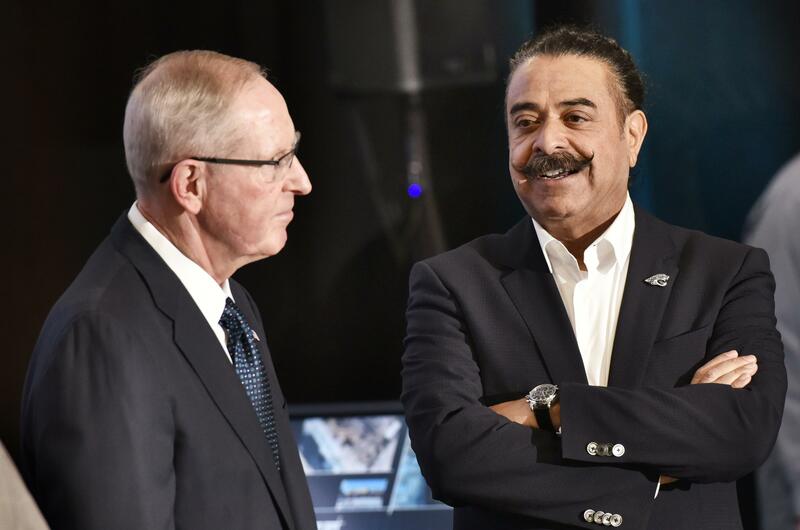 Khan and the Jaguars have the third-most space under the salary cap (about $79 million) entering free agency Thursday, and Khan is prepared to dole out even more cash. Jacksonville is expected to make significant offers to several top free agents, including Houston cornerback A.J. Bouye, Arizona defensive end Calais Campbell and Cincinnati guard Kevin Zeitler. Playing annually in London remains a significant part of the team’s local revenue, but that figure dropped from 12.4 percent in 2015 to 11.1 percent last year. Lamping blamed the decrease on the pound-to-dollar exchange rate. The Jaguars are getting close to finishing a $90 million upgrade that includes a new indoor practice facility adjacent to EverBank Field and a 5,000-seat amphitheater. The amphitheater is schedule to open Memorial Day weekend, and the practice facility will be done six weeks later. Published: March 8, 2017, 1:44 p.m.